In case you use the Amiatex.com website, you agree with the collecting of cookies what Amiatex.com uses on its website to improve the performance of its website, evaluate its traffic, and optimize its marketing activities, based on an evaluation of your interest in the goods. Some cookies may collect information that might be used by third parties and which for example, directly supports our advertising activities (so-called "third-party cookies"). For example, information about products purchased by visitors on our site may be displayed by an advertising agency in order to better customize the display of internet advertising banners on your websites. However, according to these data, you can not identify personally by yourself. 3.If you do not agree to collect some or all cookies, you can prevent them from collecting by changing your browser settings in the following way. 4.However, if you do so, you may be forced to set some options manually every time you visit our website, and some services and features may not work . Buyer agrees to store so-called cookies on his computer. 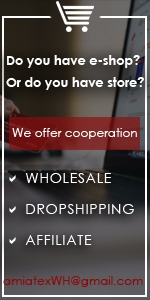 If is possible purchase on the website seller's obligations under the purchase agreement are fulfilled without the so-called cookies being deposited on the buyer's computer, the buyer may withdraw the consent under the previous sentence at any time.